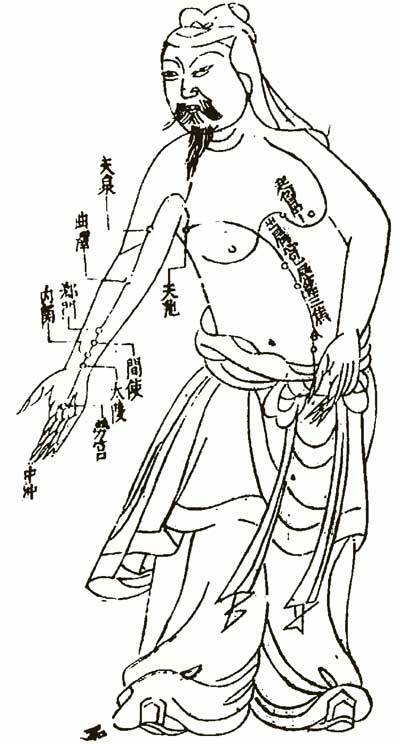 The movement of Qi can be regulated by stimulating points that lie along the course of acupuncture channels. As a whole, Qi in the cosmos takes two patterns of existence, diffused Qi and coagulated Qi. The former is more vigorous, cannot be detected directly and exists everywhere. The latter is manifested as various kinds of things that can be seen or that have certain shapes. In order to survive, coagulated Qi must communicate with diffused Qi and its generation as well as its ending results from movement of the diffused Qi. The movement of Qi is called Mechanism of Qi, which can be generalized as four aspects: ascending, descending, exiting and entering movements, which are based on directions. Ascending refers to the movement from below; descending, from above; exiting, from the interior; and entering from the exterior. The various functions of Qi are all performed by its movement. The physiological function of viscera and bowels is often reflected on their Qi's ascent, descent, exit and entry movements. Qi flows throughout the whole body because of its strength and vigor. Although the activities of the human body are multiple, they can all be summarized as these four aspects. For example, the dispersing effect of the Lung is a manifestation of the exit and ascent of Qi, while its descending effect is a manifestation of the descending and entering movements of Qi. These movements of Qi are vital to life. Once they stop, life comes to an end. The four movements of Qi have to be kept in harmony. Only in this way can the physiological functions of the human body remain normal in TCM, the physiological state in which the four basic movements of Qi are coordinated and balanced is called "harmonious functional activities of Qi". Qi has four main states of disharmonies: Qi deficiency, Qi stagnation, sinking Qi and rebellious Qi. These disharmonies may affect many parts of the body at once or within a particular meridian, organ or area. Deficiency of Qi, for example, may affect the Lungs with symptoms of shortness of breath, the Stomach/Spleen with symptoms such as poor appetite and the body in general with symptoms of fatigue and weakness. The ascent, descent, exit and entry movements of Qi are of prime importance in human life. The Kidney Essence, the food Essence transported and transformed by the Spleen and Stomach and the fresh air inhaled by the Lung, will not be distributed over the body to perform their physiological functions if they do not make ascent, descent, entry and exit movements. [Click here to continue to section 6, "The Classification of Qi "].